GQ Santana is a 16 hands high American Quarter Horse, and an APHA reserve World Champion. In the American Quarter Horse the dominant white gene appears to have originated with GQ Santana. 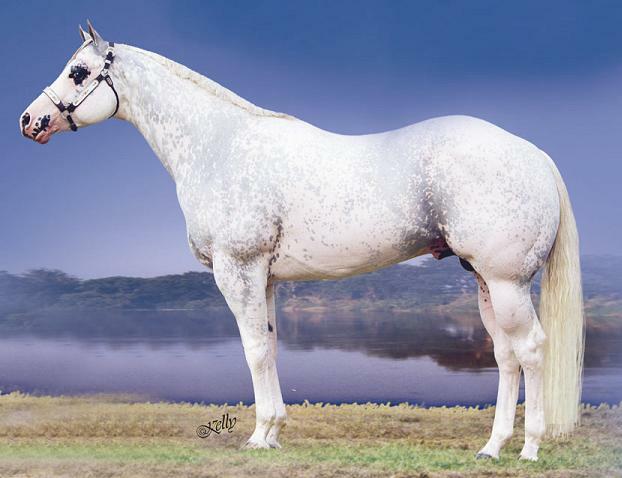 In this case he could be considered the founder stallion for dominant white in American Quarter Horses. This means he is the source of the original mutation. This isn't what is commonly referred to as a crop-out. He is the Worlds first AQHA dominant white, from which all others descend. The dominate white American Quarter Horses get more and more white hair and less dark hair as they age. GQ Santana was the most extreme white Quarter Horse to be registered with the AQHA after the elimination of the white rule in 2004. AQHA had sent out letters to judges telling them not to use the white horses in halter classes, but his owners took him and his sons and daughters in these classes anyway. Good on them! Two of his sons became AQHA Champions, "because the judges didn't care what color they were, they chose the best horses." Soon after that the AQHA executive committee met and made a rule to have "excessive white" stamped on their papers, and then banned such horses from halter classes. Realising that white was now a recognised colour in Thoroughbreds, the breeders started putting white on the foals registration papers, so they wouldn't have "excessive white" stamped on. AQHA made them change the colour to sorrel! How bizarre! It seems odd to me to disallow such beautiful horses, just because they have a dominant white gene. Greys aren't banned once they turn white. Does anyone think to stamp their papers with "excessive white", once they turn white? Of course not, it'd be silly wouldn't it! Thankyou very much to GQ Sanatana's owners David and Ryan Higbee for sharing this photo of their stunning stallion. He is now sadly deceased, but his sons and daughters carry on his proud tradition.